PDF Catalog Creator is an easy and powerful tool for creating catalog for online store.PDF Catalog Creator for osCommerce can automatically download the information of the products online, add catalog cover, index and content from the given templates as you want, then PDF Catalog Creator will create beautifully PDF catalog for you. 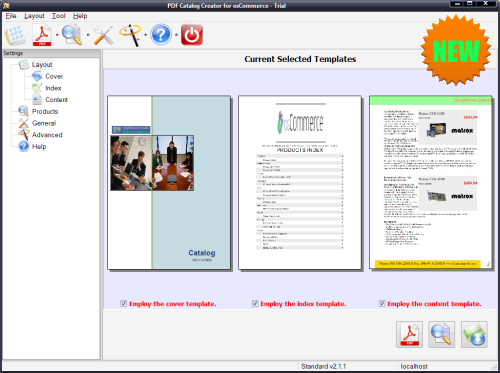 and finally you can burn your beatifully packaged PDF Catalog to CD or mail to your potential customers directly. * Excellent solution for catalog creating, It contained 22 catalog templates, easy to create multi-style catalog. Add new template only need simple copy. Advanced user can design new template themselives. * User can create catalog for all products or a part of products which user searching and choosing. * Have a local database to cache data, so operation is flash speed. * All categories and products information is available. * Automatic check new packages and prompt to update. * Support creating multi-languages and multi-currencies catalog. Qweas is providing links to PDF Catalog Creator for osCommerce 2.1.2 as a courtesy, and makes no representations regarding PDF Catalog Creator for osCommerce or any other applications or any information related thereto. Any questions, complaints or claims regarding this application PDF Catalog Creator for osCommerce 2.1.2 must be directed to the appropriate software vendor. You may click the publisher link of PDF Catalog Creator for osCommerce on the top of this page to get more details about the vendor.